guys. the garden experiment worked! (for the most part). 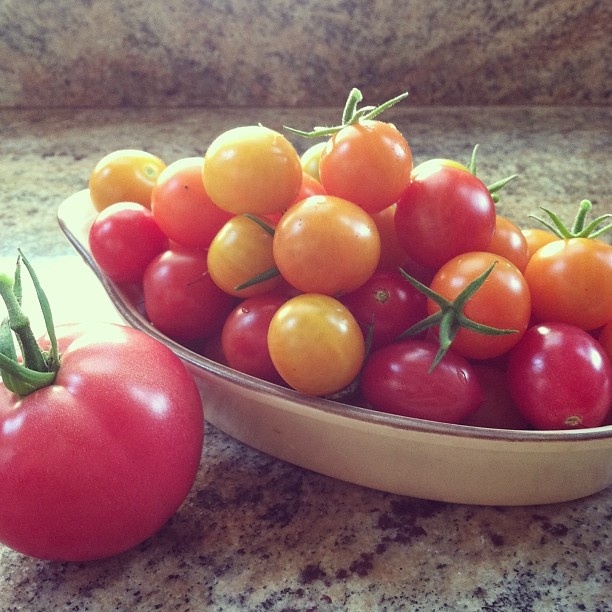 even during the inattentive weeks – these little toms pushed through and today, shiny and bright. and delicious. next year will be more informed, but nothing is quite as sweet as your first homegrown treats. so in order to live my life like it’s golden, i’ve decided to embrace this challenging season fully. and how better to kick that off than with some soup! talk is already a brewin’ about soup group in the neighborhood – goodbye fall blues, we have work to do! preheat oven to 350 degrees. chop the top of the head of garlic off, and place in oven-safe dish. drizzle with olive oil and generously salt and pepper it. cover dish with lid or tinfoil, and put in oven for 45-60 min until all cloves are roasted through and will easily slip out of their papers. meanwhile, saute the leek and potatoes in a large pot over medium heat, being sure to scrape the bottom of the pot. once the leeks are translucent and the potatoes are softening, add 1 cup of broth. simmer for a few minutes, then remove two cups of the potato/leek/broth mixture and puree. or, if you have an immersion blender, go ahead and blend about a third of your soup. you want to keep some of the potato slices and leeks in tact to make this a hearty soup. while you are pureeing, add your roasted garlic cloves to whatever blending method you choose. return pureed mixture to the pot, and add 2-3 more cups of broth and the charred corn. bring to a simmer. add all the kale, and let it wilt, 2-3 minutes, until bright green. season with salt, pepper and lemon to taste. soup group is officially in session! 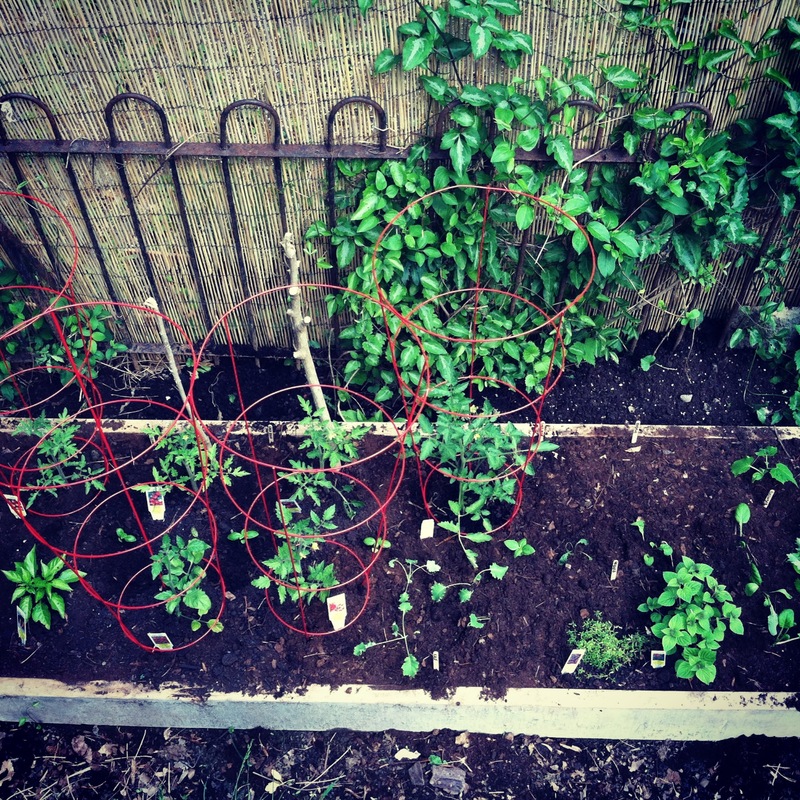 i am trying a major experiment this year: gardening. i have managed to keep 4 house plants alive in the last year, so why not jump to a vegetable garden, right? a handful of local friends have encouraged me with their swanky gardens and dinners of “fresh from the garden” produce. and so, here is my tiny attempt. i went overboard with tomatoes, because really guys, you just can’t have enough tomatoes. 6 tomato plants, all of different varieties – grape, cherry, purple, zebra. and so far they are all fairing well. there are heirloom radishes popping up – a gift from my friend dee that i am so very excited to harvest. red, white, and who knows what else is in the mix. golden beans and royal purple beans are just now sprouting. there is a mesculen mix, arugula, kale, hot hot peppers, and a couple herbs: nutmeg thyme, tangerine sage, and basil. this weekend i used the nutmeg thyme to make a white bean hummus on toasted crostini with roasted garlic, lemon and olive oil. looking forward to more inspiration from this tiny raised bed throughout the season! On a day when the wind seems to whipping extra fiercely down the streets of center city, I’m dreaming of spring. Sunny skies and fresh produce. That’s all I want. Oh, and a little less wind would be great too. The screenshot below doesn’t capture the essence of this video. I just love it. It’s a video narration of a chapter from Tamar Adler’s book An Everlasting Meal. Beets, cauliflower, garlic, potatoes, meal prep, canning jars….go slow, enjoy each bit. My mom makes a delicious granola, one that went down in infamy in my brother’s fifth grade classroom cookbook as: “my mom’s favorite recipe because she has it for breakfast every morning.” Just the smell of this baking transports me to good old Longfellow Road. And how adorable is this note he included in mom’s copy of the cookbook? In honor of Mother’s Day, I’d like to thank you for the many things you do for me. You are always there for me. We are also cooking all the time. We’re always doing Book Projects together. You’re always letting me invite someone over to play. I have many wonderful memories about you. My favorite is when I threw up peanut butter & jelly sandwitches on your hand in Ocean City. Thanks for being my mom! 1. Preheat oven to 325. Melt butter and add honey. Then add cinnamon and slivered almonds. Pour over oats, and mix to coat. 2. Spread mixture on a baking sheet. Bake at 325 for 30 minutes. Take it out just as it starts to turn golden. It will continue to harden after you take it out. If it bakes too long, it will be very hard and burnt and also lame. I have a lot of favorites. For example: popsicles are my favorite summer treat (clearly), soup is my favorite winter meal (obvi), snap+cider is my favorite drink (what else is there? ), and millet wins favorite in the grain category. It’s just so tiny and cute and crunchy and nutty….I love it so. from Tastebook – I usually halve this recipe, but really, I always want more, and they’re best when shared, so it’s probably a good idea to whip up the full version. Preheat over to 375 degrees. Butter 24 muffin-pan cups. In a large bowl, sift together the flour, baking powder, salt and baking soda. Stir in millet. In a small bowl, whisk together eggs, milk and vanilla. In the bowl of a mixer with paddle attachment, beat the butter and brown sugar until light and fluffy. At low speed, add the flour mixture alternately with the egg mixture, beginning and ending with the flour mixture. Take care not to over mix (this direction gives me great anxiety – but it is very true – otherwise your muffins will be tough and dry, and nobody wants that). Spoon batter evenly into the prepared muffin-pan cups. Bake 15 to 20 minutes, rotating the pans between the upper and lower oven racks half way through. Bake until a toothpick comes out clean. Cool for five minutes and then remove from pan and continue to cool on a wire rack. *toast the millet by spreading it out on a cookie sheet and baking it in a 350 degree oven for 10-12 minutes. Every three or four minutes, take the pan out and give it a careful shake, to make sure that every kernel of millet gets toasted. Preheat your oven to 350°F and butter a 9×5-inch loaf pan. In the bottom of a large bowl, mash bananas with a potato masher or the back of a wooden spoon until virtually smooth but a few tiny lumps remain. Whisk in egg, then oil, brown sugar, syrup and vanilla extract. Sprinkle baking soda, salt, cinnamon, nutmeg and cloves over mixture and stir until combined (again – do not over mix! No tough muffins here!). Stir in flour until just combined, then add millet. Pour mixture into prepared pan and bake until a tester comes out clean, about 40 to 50 minutes. Cool loaf in pan on rack. I couldn’t decide between muffins or a loaf – so I made BOTH. YUM. Like many others, I have always feared making a risotto. I’m a bit of a perfectionist, so the thought of all the ways such a delicate dish could go wrong kept me at bay. Until today. Several friends have been making risotto lately, and they gave me courage (Thanks Krista, Jen and Sonja!). I had two acorn squash hidden in the back of the fridge needing to be put to good use. After some online recipe hunting, I came across this Faux Martha post. I edited to my liking and available ingredients. dash of cloves – I threw in one whole clove, then removed at the end. Roast acorn squash. Place in a 350° oven. Bake for about 20 minutes or until you are able to cut squash in half. Place the two halves on a baking sheet, skin side down sprinkled with a bit of olive oil. Bake for another 20 minutes or until squash is soft. Allow to cool. Remove squash from outer peel. Mash and set aside. (This can be done up to a week in advance.) I roasted two squash, to use the second set as serving dishes. In a saucepan, melt butter on medium-high heat. Saute leeks, mushrooms and garlic until leeks are translucent. Add rice to pan, coating with butter mixture. Add acorn squash and spices. Stir. Cook over medium heat, adding one cup of chicken stock at a time until liquid is absorbed. Stir often. Add salt and pepper to taste. Before serving, remove bay leaf (and whole clove!) and stir in cheese and cream/milk. Garnish a sprinkle of extra gruyere. If you prepared extra acorn squash, serve the risotto in the shell of the extra squash (flesh still intact so it maintains its form – there’s nothing wrong with a little extra squash!). SUPER pleased with the results! Incredible flavor, each ingredient both stands out and blends into the whole in beautiful ways. Will definitely be attempting more risottos in the future.